It’s important to understand that barrel sanitation using ozone is not the same as barrel sterilization. The surface of barrels do not have a discrete surface, it is more like a 4-5mm sponge, often with blisters. The porosity of the barrels provide far too many nooks and crannies for ozone in any concentration and duration to completely eradicate all microbes. The ozone treatment of barrels is designed not to eliminate microbes, but instead to control them. This concept of microbial control is especially important when ozone is used to treat barrels with high populations of microbes, which can produce off-flavors or cause wine spoilage. Many wineries have implemented ozone as a part of their barrel-washing practices. 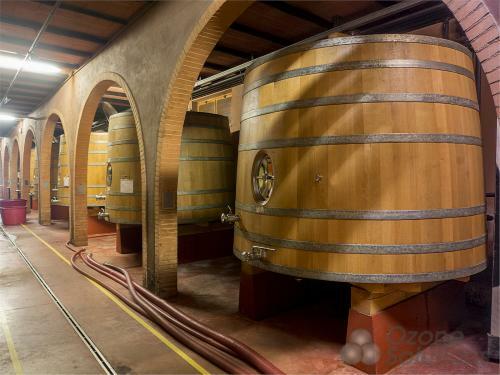 Standard procedure for barrel washing varies from winery to winery, but it typically includes a high pressure, hot water rinse, followed by a dissolved ozone water treatment. The concentration of ozone applied, as well as the contact reaction time in the barrels, depends on the quantity and nature of the contaminant. Larger quantities of microbes in contaminated barrels require longer treatments, but smaller doses may be required to handle sensitive materials. Typically, a 2.5 ppm ozone concentration for two minutes on healthy barrels, after a hot water flush, is sufficient. If the barrel is severely contaminated, a five-minute treatment may be required. Ozone offers higher sanitization quality, time, and energy savings. Decreased chemical use by using natural ozone gas, which is produced safely. Economical through sophisticated, yet easy-to-use integration. Ozone generation and contact systems are the world’s most powerful cleaning process. Diagram of an example Ozone CIP System. The biggest threat to winemaking is contamination during the long production process from harvest to tank to barrel to final bottling. Clean-in-Place (CIP) involves cleaning and sanitizing pump systems, pipes, tanks, hoses, filters, and bottling lines. Using ozone in the CIP process saves time as well as costs. Dissolved ozone water is circulated through the piping systems and reacts with organic material. Many modern ozone generators have controls built-in which receive signals from ozone sensors connected to the pipes or tanks. This allows machinery to be cleaned and sanitized easily and automatically. Without ozone, CIP sanitation must be done by one of two ways. The first is by using chemicals, typically chlorine or iodine solutions, requiring multiple rinses afterwards to remove noxious residues. The other option is by using heat, usually high temperature water or steam, which is very expensive to produce and creates a danger for cellar employees. In contrast, ozone achieves CIP sanitation at low cost, at ambient cellar temperatures, and without harsh chemical residues. Furthermore, hot water or steam causes the expansion and contraction of welds, one of the biggest causes of line degradation and repair. Heat can also bake on materials inside the lines, making them more difficult to clean. Since ozone is used in cold water, it avoids these and other issues caused by heat based CIP sanitation. The direct germicidal action of ozone is well known against all types of microorganisms, such as fungi, bacteria, and viruses. Ozone fights against bacteria such as pseudomonas, flavobacterium, streptococcus, legionella, etc. Ozone is especially effective against fungi and bacteria, which are the main cause of degradation of vines. Ozone is very efficient against these microorganisms, which are able to propagate and reproduce in harsh and extreme conditions. Ozone has a very powerful and strong oxidation capability and therefore destroys organic waste by oxidizing it. It is also very environmentally friendly, as it does not leave behind any harmful residues and reverts back to oxygen unlike pesticides, fertilizers, and additives used from growing crops. Use of dissolved ozone water for irrigation ensures that plants will grow more vigorously and will be healthier, free from any kind of contagious diseases. They may also have other functions such as plasterboards, palletizing, plastic film wrapping, puckering, etc. Bottling lines have recently been rapidly developed. They have gone from bottling manually or large automatic lines to small and fully automated lines. It is rare to find wineries bottling manually, even small productions use automatic bottling systems. In production of table wine, bottlers often achieve 50,000 bottles/hour, which is logical since they are dedicated to large productions of wine. Washers are provided with storage tanks containing wash solutions, supply valves to steam them, and nozzles for spraying pressurized bottles with such solutions. Rinse first to eliminate impurities. When washed with a solution of soda a good hot chemical cleaning and disinfection of the bottle is achieved. The disinfection stage may be incorporated into the full cleaning cycle and be applied before the washing with detergent and hot water (70-75°C). In other cases the bottles are usually washed with solutions of 1.5-2% SO2 in which the microorganisms are destroyed. The washing process should last about 15-20 minutes. Filling by following the system of communicating vessels. The bottles are filled up to the same level as the wine is at the filling tank (storage wine tank). This system has the disadvantage of being slow but is very simple. Filling monitored by pistons or another method. This procedure is followed when you want to accurately determine the weight or volume of liquid to be bottled. Filling with sterilization. In this method, bottling circuits occurs, and the wine passes through a sterilizing filter before entering the bottle. During this procedure hygienic operating conditions are maintained in an atmosphere of CO2 SO2. The SO2 has the disadvantage of corroding the materials containing it. Isobaric Filling: Sparkling wines are filled using equal barometric pressures operating at high or low pressure.